The European Union has defined an excess indicator for the protection of vegetation and forests. The AOT40 for forests (= Accumulated Ozone exposure over a Threshold of 40 ppb (=80 µg/m³)) is the accumulated excess of hourly ozone concentrations above 80 µg/m³ between 8:00 and 20:00 CET (Central European Time = Universal Time (UT) +1) over the period April-September. This indicator quantifies only ozone exposure, i.e. not the effective ozone uptake by (and therefor damage caused to) vegetation. The largest AOT40 for forests can be found in the southern and eastern part of the country, where also most forest resources are situated. 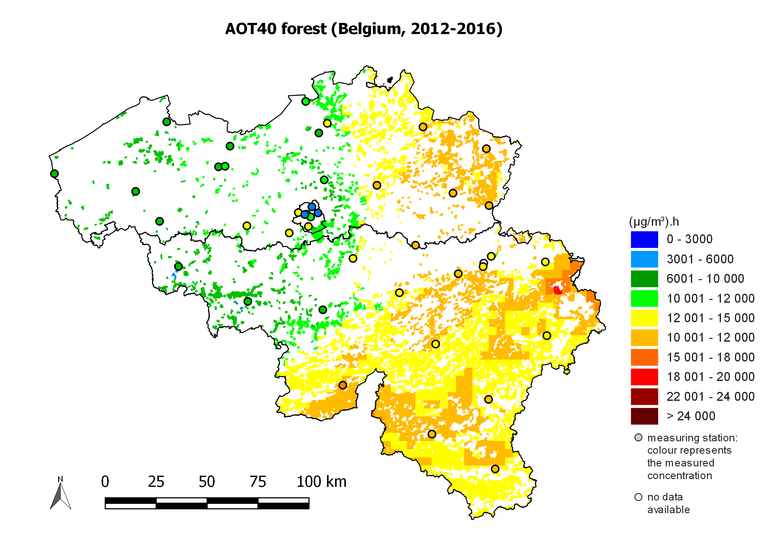 The largest AOT40 for forests was recorded in particular in the High Fens. . None of the Belgian forests was exposed to an AOT40 above the reference value of 20000 (µg/m³).h. Yet in almost all forest resources (94%) the AOT40 exceeded the critical UNECE level of 10000 (µg/m³).h. Spatial distribution of the ozone excess for forests (AOT40 for forests), 5-year average 2012-2016. 'No data' means that the data do not meet the criteria set out in 2008/50/EC Annex VII for aggregating the measurement data. All data were calculated using the RIO interpolation technique.